Happy Valentine's Day, my lovely stitchers. So, Nashville Market. I've written about how excited I am to attend for the first time this year. I would love to meet the designers in person, see what great patterns they have in store for us in 2017, and just and overall good time. Unfortunately, it is not meant to be for me this March. I will be having surgery on Valentine's Day and can't venture that far from home so soon after the surgery. Darn it! I have been inspired by the Boleyn linen that we brought in from Europe. I adore it! We have created our own line of imprinted linen. We call it French Market (Marche Francais) and are currently offering it as a 30 ct creme brulee, cut to 8.5 x 13. We are going to offer additional designs very soon. I can't begin to tell you how fulfilling it is to create something and to find out that you all love it, too! 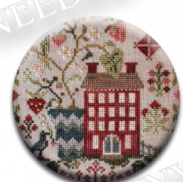 If you are looking for a gift for yourself or a stitching friend, check out our adorable needle minders or 'needle nannys' as the manufacturer calls them. These are very strong magnets that feature some of the most popular patterns by some of your favorite designers. Here is Strawberry Fields by Blackbird Designs, one of my favorite designers. And, last but not least, my valentine's gift to you! Thank you for helping make my dream come true.